Today I’ve got more delicious summer food for you! It is a sweet treat from our friend Christine at Must Love Home. If you link up with us on Fridays, you are probably already familiar with Christine. (She’s one of our Friday Favorites hostesses!) If you’re not familiar with Christine, please go over and pay her a visit. You’ll love her blog! But first, check out Christine’s guest recipe! Hi everyone. I am Christine from Must Love Home. I was honored when Jerri asked me to be a part of her Summer Recipe series at Simply Sweet Home. At Must Love Home, I am able to share my love of DIY, decor, creating easy recipes, cooking, and well…eating! 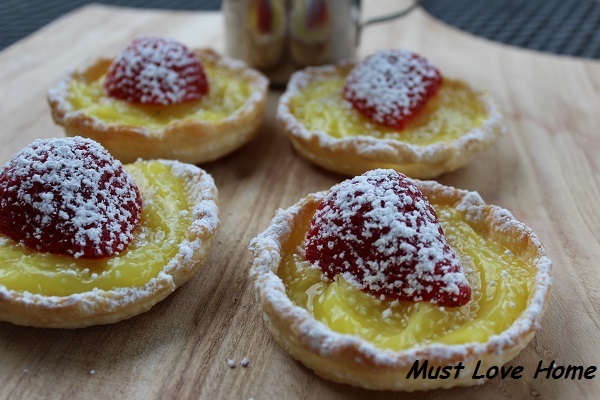 Today I want to share one of my most delicious and simple recipes: Mini Lemon tarts with Strawberries. 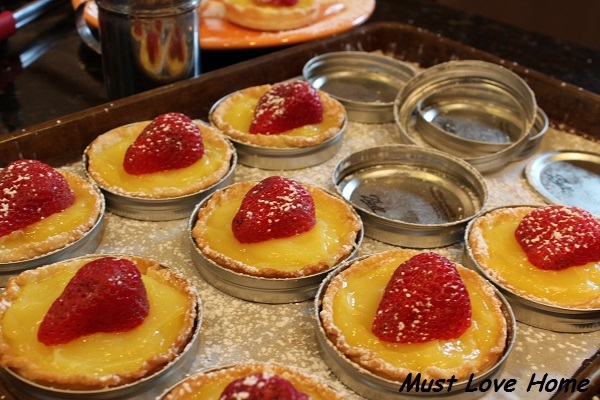 The beauty of making these tarts is that you do not need any expensive tart pans. I use wide mouth mason jar lids!! And the recipe only calls for four ingredients. Let’s get started! Preheat oven according to pie crust package directions. Place your tart pans or lids onto a baking pan lined with parchment. If using mason jar lids, you will want to place the insert into the ring with the rubber down. Give each pan a light spray with cooking spray. Set aside. Roll piecrust on a floured board to about 14 x 8 rectangle each. Cut dough into circles about an inch wider than your lids (or tart pans if you are using them). I use a small bowl to cut around. Place each circle into a tin, the sides should come slightly over the top of the pans. Using a fork, puncture the dough in the bottom of the pans a few times. Chill in the refrigerator for 15 minutes, then bake according to package directions until golden brown. When done, set aside to cool. When pans are cool, fill each crust with Lemon Creme. Do not remove the crust from the pans. 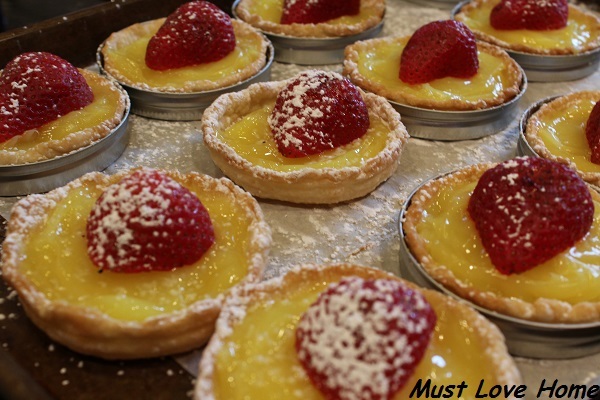 Place a strawberry half on top of each lemon creme tart. Chill for several hours. To remove from lid, pick up lid from the sides, push up on the insert from underneath an “pop” out the tart. Thank you for joining me today for the Summer Recipe series! Have a wonderful day –Christine!